Karl Trotter - My Lost dream but now I can help others and Help For Heroes. From the age of seven, Karl Trotter had big ambitions for his future – he wanted to be a pro wrestler. Karl was aged 19, when he still dreamed of becoming a wrestler. Inspired by Roddy Piper, the now-retired Canadian fighter, Karl, from Harold Wood, learned karate, gymnastics and amateur wrestling at the Tokei Martial Arts Club, close to London Bridge. He also trained alongside former British freestyle Olympic wrestler Douglas Thompson, with the hopes of becoming successful in the ring. However, at the age of 12, his dreams of professional fighting took a heartbreaking hit. Battling against his disability, Karl travelled 7 hours a day and then trained six hours a day at Hammerlock alongside sports figures Doug Williams, Justin Richards, Andre Baker and Alex Shane in pro wrestling and budo sombo submission wrestling. But by 15, Karl began to have trouble with his balance. 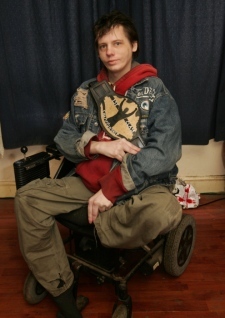 By 18, he was barely able to walk, and by 21 he was in a wheelchair. He said: ”I did everything I could to ignore my disability and achieve my dream, but eventually there was nothing I could do and had to stop wrestling. Karl continues to support the sport he loves, recording wheelchair wrestling matches on YouTube, gaining college merits for projects on wrestling. “I had all but given up on having anything to do with wrestling,” Karl said. Now he has decided to work with Help For Heroes, running a fundraising wrestling show in August with the aim of raising awareness of the charity and highlighting pro wrestling as a sport for the next generation. Karl, who has relatives in the Army, said: “It is said British Wrestling died in the mid-80s. We want to give it a rebirth. Help For Heroes is a charity that supports veterans and serving personnel who have been wounded or injured, or have become sick, as a result of serving their country. Karl said: “I know how frustrating it can be to lose the ability to do something you love. I’d like to raise money to support those who have suffered a similar problem. Karl’s charity wrestling show was unfortunately hampered by severe weather conditions but still had a good turnout of fans despite this and managed to raise £600.00 for the charity. .